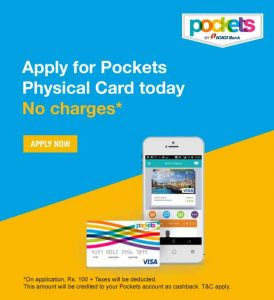 Order Icici Pockets Physical Card Absolutely Free ! Yes.You can Swipe that Visa Card anywhere for offline shopping or transactions or Online transactions. How to Get Pockets Visa Card Free? • On the Dashboard you will see a pop up of "Free Card"
• Within few days you will receive Physical Visa Card of Pockets by ICICI bank absolutely free!